Have you ever looked through a magazine and had home envy? One of our latest projects with Todhunter Earle has just been revealed in the new August issue of House & Garden. Basking in the scorching summer sun, House & Garden gives you a taste of what the space looks like by day. We thought we would go one step further, and give you a sneak peak into how lighting makes all the difference to this stunning home by night and share a few tips on how to recreate the look in your home. The project was atypical in its approach to bring the outside in. Our lights not only enliven pale oak floors from Schotten & Hansen and all-resin worktops by OrsiniBrewin but also the fertile trees and tranquil water feature that lure you inside. Water features are a wonderful medium to light as the movement and refraction creates patterns which reflect on the surrounding area. By night, lighting your outdoor surroundings creates the magical effect of candle light, the perfect setting for hosting guests on hot summer evenings. To achieve a similar effect in your garden, use a simple underwater spotlight (Pond Light) under a water flow. You may also want to consider using fibre optics within water jets to create a magical effect candle light. To create a light from within effect. we used LED exterior spike lights to light the trees. Our Richmond LED Garden Floodlights are ideal garden lights as they can be easily moved to suit the changing seasons and planting growth. 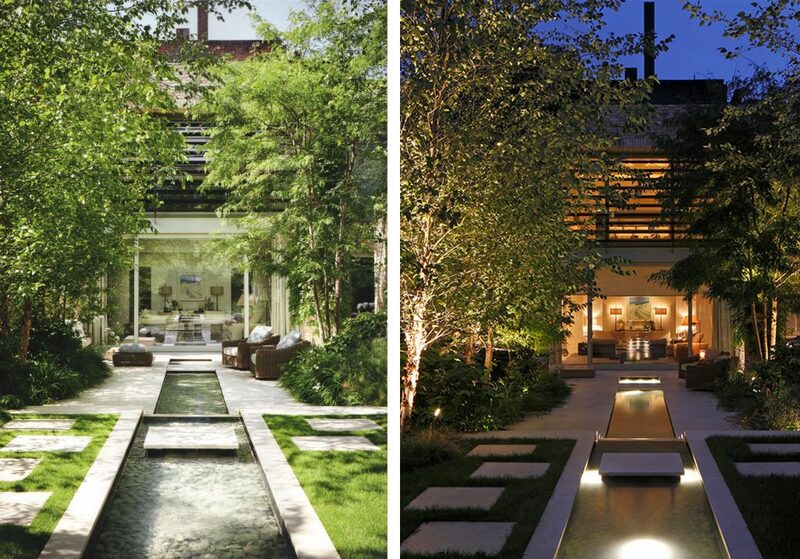 For more ideas on how to bring your garden to life, check out our Garden Lighting Tips. For your front door, it always works to overscale with statement pieces such as these large pots. We have uplit them with low glare Lucca External uplights to add to the drama and gave the planting beyond an extra punch with 1w Hampton floodlights.. At night, our indoor lighting also cuts through the darkness, beckoning your visitors inside. 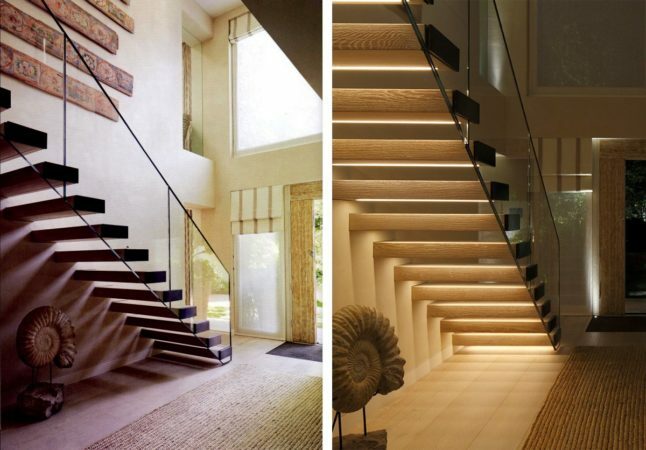 For open riser staircases like this suspended limed oak masterpiece, the light source can be hidden from view under each tread. When not illuminated the Contour LED strip recessed into the underside of the step is invisible. When lit it creates a beautifully soft floating effect. This lights the tread below and casts wonderful shadows under the stair case. When you’re curling up on your sofa in the evenings, add to your feeling of hygge with some warming shelf lighting. Consider front and back lighting your shelves with Contour HD24 to add depth, illuminate and accentuate your books and precious objects. A lit joinery serves as a wonderful source of light in in the evening, creating an illusion of having an extra window in the room. Kitchen lighting design is probably one the most demanding in the home as it needs to reflect the wide variety of functions. This particular project features lighting in the centre of the island with LED recessed downlights ensuring the space is practical. To add more impact, we lit the centre of the dining table and back lit the shelves for the added drama. 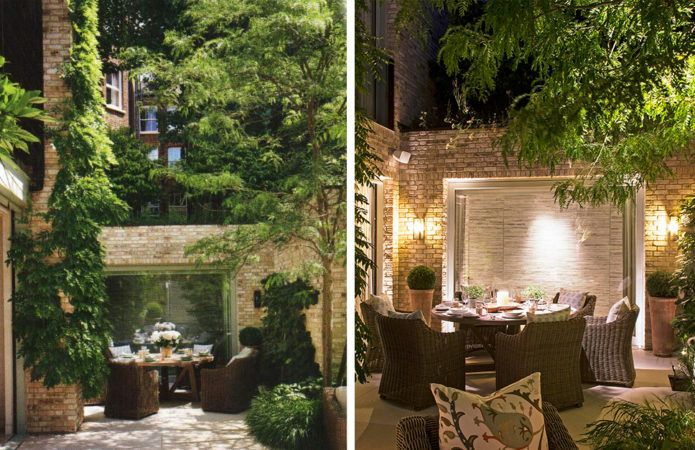 When your garden is as perfect for entertaining as this project, try using some atmospheric lights. 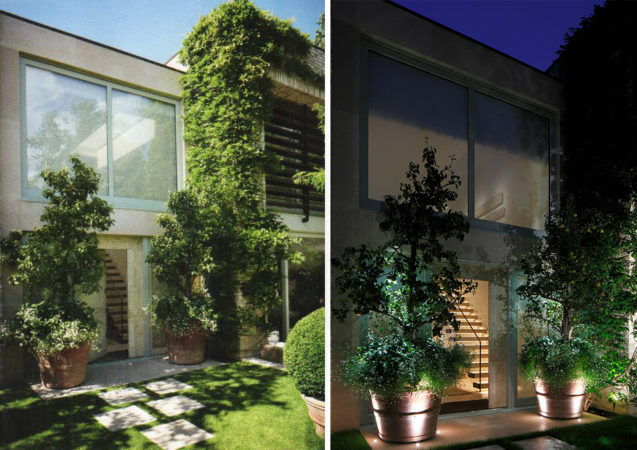 To achieve this effect, we used a couple of wall lights, a few Richmond floodlights illuminating the greenery and Lucca External uplights around the windows. 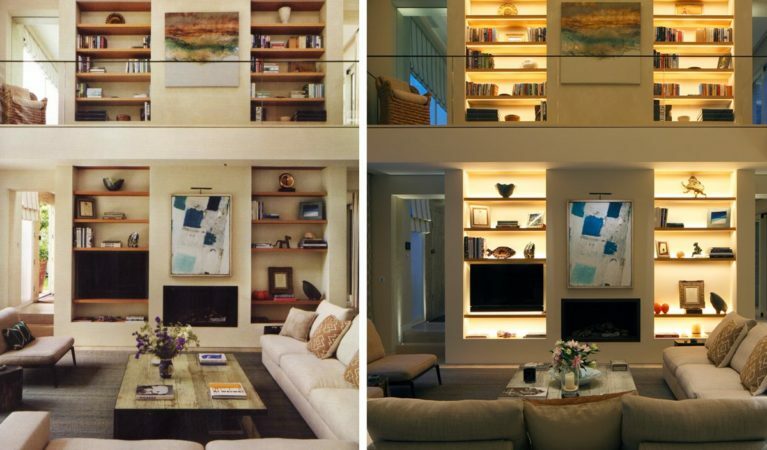 If you are looking for more inspiration for your project, check out our project portfolio and room-specific lighting tips. If you would like to talk to us about creating a bespoke lighting design for your property, please contact our UK & Europe office on 020 7371 9000 or email design@johncullenlighting.com.